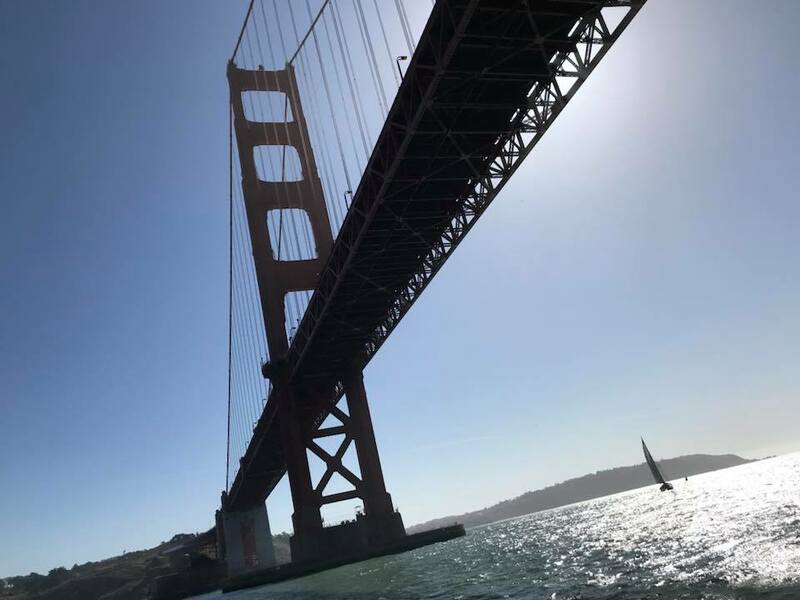 Who would think when you sign up for a yoga teacher training class in Auburn California that you would end up sailing around the San Francisco Bay on a beautiful Sunday afternoon for one of your class days? That’s what I love about life, is that if you are open, you just never know where the day will take you. I thank any of you who sent a positive thought for a fair-weather day, because it could not have been a prettier day on the bay. After so much hard work on everyone’s part, it was nice to relax and spend an amazing day enjoying the surrounding beauty and getting to know each other aside from on the mat. This experience continues to amaze me … stretch me … challenge me … and delight me. I think every once in a while, what if I hadn’t signed up? I wouldn’t know what I was missing. And I guess that in a nutshell is life. We make our choices, and life is always a compromise. When we choose one direction, there is alternatively another choice down a different path with entirely different possibilities. And I don’t believe so much in right or wrong, as every experience in life has its lessons. I think more that it’s just important to try our best to make sound choices, and continually engage with that wise soul deep inside … Am I happy? Am I feeling fulfilled? Is there more I want to do or need to do? What’s next? And again, I can’t emphasize enough, no right or wrong answers. For me, though, I want to feel I’ve used my time wisely and made a difference. I can’t help but have some regrets when this life is over, as I’m human, and I’ve made my share of mistakes. I’ll be okay with that. What I don’t think I will be okay with is regretting what I didn’t do. Those are the moments we do have the control over. We can make the choice to put one foot in front of the other even when it’s hard, even when we are afraid, if there’s something worthwhile at the other end. And even if whatever we try doesn’t turn out, there’s much less regret in that than in letting yourself down without trying. As I’ve said before in this blog, sometimes I feel like there’s a higher power aiding and abetting this journey I am on, my blog, the yoga training. As I’m sitting here writing this, my cell phone rings and the caller id is MY NUMBER, and it says “maybe Sue Ferrera” on my screen. What? How does that work? I didn’t answer it. I was a little afraid. After all, there’s so many strange things going on these days with technology, can’t be too careful. I did check, however, to see if I left myself a message. So far, I have not. My friend, Peter, said I should have answered as it might be a call from Green Acres. In the scheme of this post, though, this call makes me think wouldn’t it be great if some future version of myself had the power to give me a ring to tell me hey, you might want to avoid this or that or hey, you’re really on to something there! Unless today is the start of some new phenomenon, for now I will just have to be satisfied to listen to that inner voice and try to make as many possible choices as I can that leave me feeling like I did yesterday, just happy to be right where I was and knowing I was doing something very positive for myself, and hopefully others down the line. Closing, check out this post from a fellow blogger, Yogafivefifty, https://wp.me/p9r9Y6-15W. I read it yesterday morning and loved it as it’s just what I was feeling Sunday. Whatever brings me moments like what he describes, that’s what I want to remember when I look back one day, A LOT of very contented moments. P.S. By the way, I just called back again. I was on the phone, so I could not answer myself. If I call a third time, I’m going to answer to see what I have to say. I’ll keep you posted. Like the sea, our choices are infinite! I love seeing you on that beautiful boat with the sun shining and a big smile on your face. Your courage to try new ventures is inspiring to many! And for me, well, it confirms that, no matter when and why we make changes in our lives, that ultimately whatever the outcome is, there will be perks and there will be let downs. One thing you wrote resonates with me….you proclaimed that you can’t be more let down from decisions that didn’t go as planned as to NEVER try for change . Continue inspiring! You are rocking the boat and much more! BTW…I think that was your mother calling….